As residents of North Carolina deal with the impacts of Hurricane Florence, many communities in the United States are still recovering from the 2017 hurricane season, one of the most devastating in history. Three hurricanes—Harvey, Irma, and Maria—caused damages totaling $265 billion and are now on record as three of the five costliest US storms of all time. 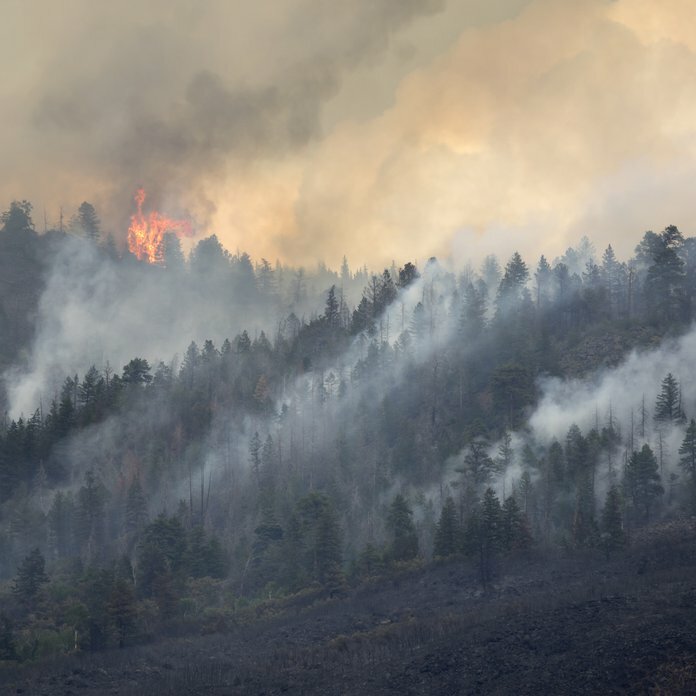 The amount of disaster aid appropriated by the federal government in the wake of the storms (and in response to a severe wildfire season) was also a record, totaling over $130 billion in two supplemental appropriations bills and the budget passed by Congress in February 2018. The Federal Emergency Management Agency (FEMA) provides aid after a disaster through three main programs—Individual Assistance (IA), Public Assistance (PA), and the Hazard Mitigation Grant Program (HMGP). PA and HMGP provide money to state and local governments—PA for debris removal and repair of government-owned facilities and infrastructure, and HMGP for investment in mitigation to reduce future disaster losses. The IA program is money that goes directly to individuals and households; the bulk of the IA money is in the Individuals and Households Program (IHP), which provides money for housing repair and replacement, temporary housing assistance, and other needs such as uninsured medical expenses, vehicle damage, and repair of household items. FEMA can provide up to $34,000 per household in IHP assistance. In June 2018, FEMA publicly released the 2017 IHP data. A total of 4.7 million people applied for assistance in response to Hurricanes Harvey, Irma, and Maria. Of these, 22 percent of Harvey applicants (196,040), 18 percent of Irma applicants (468,000), and 27 percent of applicants affected by Maria (301,929) received housing and other needs assistance. 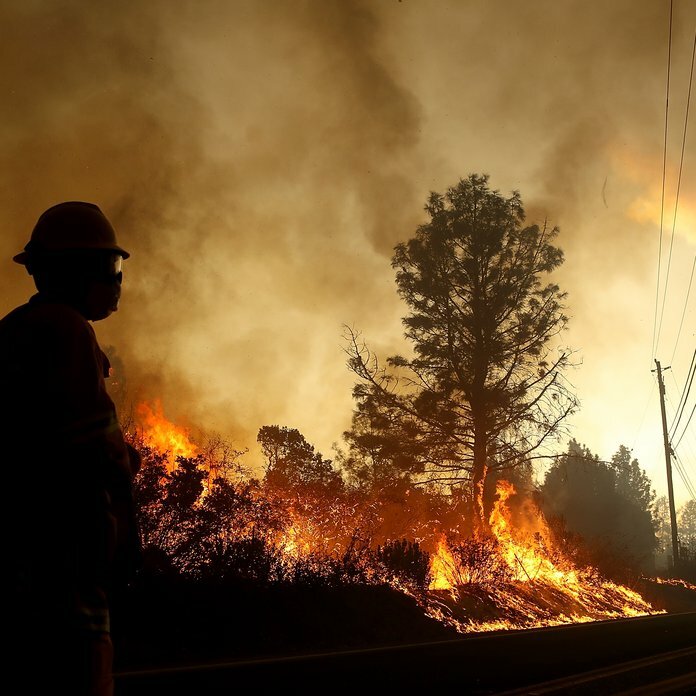 The relatively low share of applicants receiving assistance is not uncommon in disasters and can be due to faulty or incomplete applications—often a result of the complicated application process—or because insurance may have covered the losses. (In addition to the IHP, FEMA also provides transitional sheltering assistance (TSA); including TSA-eligible households brings the numbers receiving assistance up significantly, especially for Hurricane Maria.) As of June 2018, FEMA had distributed $2.5 billion in total housing assistance. Harvey accounted for 48 percent of this spending, Irma 28 percent, and Maria 24 percent. First, as has been pointed out by others in the past, individual housing assistance amounts are relatively small and are unlikely, in most cases, to provide enough money to fully repair a damaged home, or in many cases, even come close. 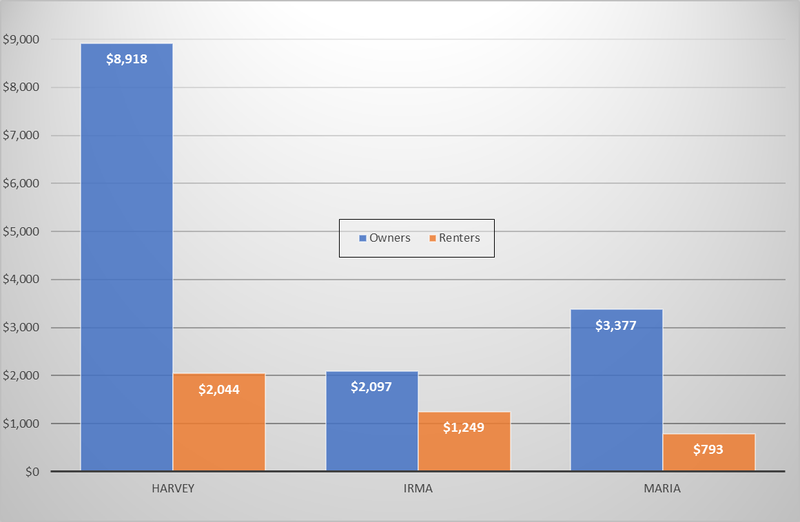 The average amount paid to homeowners in Hurricane Harvey was just over $8,900; in Irma and Maria, it was approximately $2,100 and $3,400, respectively (Figure 1). Renters receive less as most do not receive money to cover home repair and replacement expenses. FEMA makes clear that funding through the IHP is not designed to return a dwelling to its pre-storm condition; the agency is only concerned that it be habitable, and observers have noted that the bar for habitability can be quite low. Indeed, FEMA’s property damage estimates for homeowners who received assistance in the three storms averaged only $13,100 in Harvey, $4,454 in Irma, and $7,628 in Maria. Data from flood insurance claims, by contrast, show that average paid losses for the three hurricanes as of June 30, 2018, were $115,104 (Harvey), $46,989 (Irma), and $55,193 (Maria). 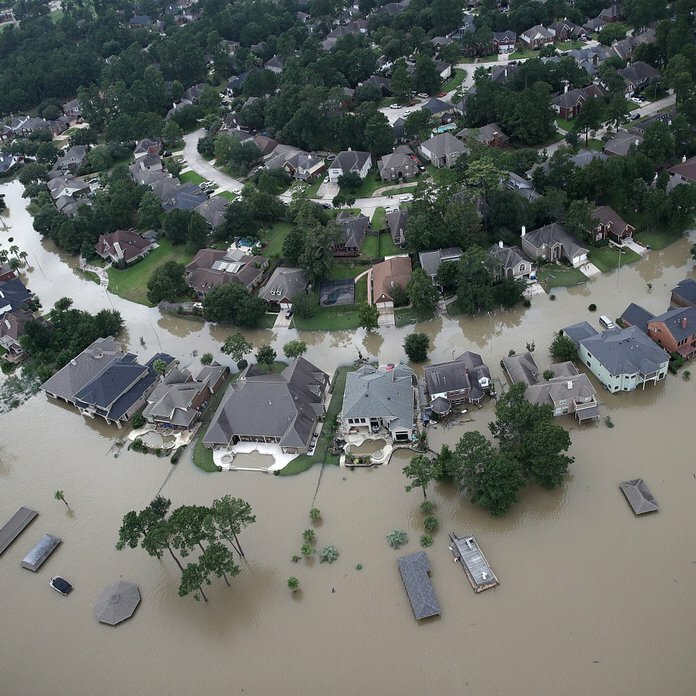 Second, most homeowners that experienced property damage and received disaster aid did not have flood insurance and a surprising number did not even have a general homeowners insurance policy. Flood insurance coverage rates for homeowners who received assistance were as low as 2.3 percent for applicants affected by Maria, and 28 and 14 percent for those affected by Harvey and Irma, respectively. Although households who register for assistance may be less likely to have insurance than those in the general population (FEMA requires that insurance be used first and policyholders may decide not to apply for aid if insurance covers their losses), others have reported low insurance coverage in communities affected by the storms. FEMA estimated that only 20 percent of households affected by Hurricane Harvey had insurance, and a February 2018 Wharton study found that less than 4 percent of households in Puerto Rico had flood insurance. The IHP data also revealed, surprisingly, that even basic homeowners insurance was missing for a lot of damaged homes: 37, 34, and 79 percent of homeowners in areas affected by Harvey, Irma, and Maria, respectively, who received IHP assistance did not have homeowners insurance. Although a homeowners insurance policy will not cover losses from flooding, it generally will cover lightning, wind, and hail damage, as well as things like perishable food or medicine losses due to power outages. Finally, the data reveal that higher-income households received greater housing assistance, on average, than lower-income households (Figure 2). 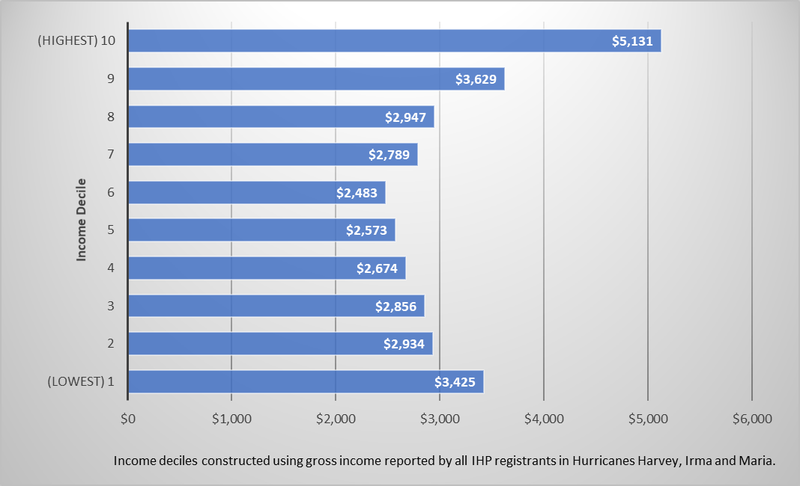 We grouped households who applied for assistance in all three hurricanes into deciles based on their reported gross incomes. Households in the highest income decile were granted, on average, $5,131 in assistance, while households in the lowest decile received $3,425, on average. Greater property damages for higher-income households likely explains this result—the average household in the highest income decile had estimated damages 67 percent higher than the average household in the lowest income decile. Since damages are higher when the value of the home is higher, this is not surprising. But these findings confirm what others have pointed out—that poorer households often have greater difficulty recovering from a storm than wealthier households and the way that federal assistance works can contribute to the problem. Poor households are less likely to have flood insurance (indeed, among housing assistance recipients in the three 2017 hurricanes, approximately 36 percent of homeowners in the top decile had a flood insurance policy compared to only 3 percent in the bottom decile); are less likely to qualify for a Small Business Administration loan (another important source of aid after a storm but one that is dependent on having good credit and a means of repaying the loan); and are less likely to have savings to use toward recovery. Direct assistance to individuals and households after a disaster is an important part of the federal government’s disaster relief efforts. In the wake of the devastating 2017 hurricane season, data from FEMA’s Individuals and Households Program helps us learn who was harmed in the hurricanes and how much financial help the federal government was able to provide. Our take-aways about the magnitude of assistance, insurance coverage, and effects by income group shine a spotlight on the vulnerability of households living in hurricane-prone regions. The views expressed in RFF blog posts are those of the authors and should not be attributed to Resources for the Future.